Many years ago during my physics lesson, my teacher made so much emphasis on the fact that for an engine to function properly, there must be an oil which aids the machine as a lubricant. Without adequate lubricant in an engine, the engine might knock down, collapse or suffer from friction. Today, I apply this lesson I learnt years ago to the precarious conditions Biafrans face in Nigeria presently. During the pre-independence era in Nigeria, Biafrans were being massacred in their numbers. Again, in post-independence Nigeria, more Biafrans were slaughtered which later culminated to the 1967-70 genocidal war waged against Biafrans by Nigeria and her allies, in which more than 3.5 million innocent Biafran citizens mostly women and children were exterminated and starved to death. The Biafrans have always sacrificed so much with their sweat in all local and foreign lands in which they sojourn; in supporting and upholding the unity and development of Nigeria. But like the proverbial Shylock, Nigeria will always draw our blood to function. Biafrans’ blood will always serve as lubricant for the engine of Nigeria’s unity until they are completely emancipated and liberated from Nigeria’s bloody grip on them. For the mere fact that our contributions and sacrifices are never recognized or appreciated, either in the past or in this present Nigeria. Rather, our people are being mowed down like common criminals; for only demanding and exercising their inalienable rights to self-determination under local and international laws. 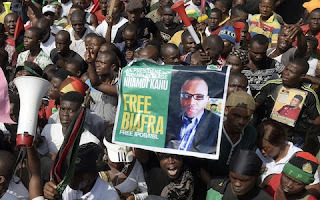 There have been massive clamp down, abductions, illegal arrests and detentions without trial; brutality and torture, summary executions carried out against unarmed Biafra activists for merely asking questions and demanding for plebiscite to determine their future and that of their unborn children. After the terrible and deadly holocaust, the world said never again, after the genocidal war against Biafrans, the world must have muttered never again. After the Rwanda genocide, the world rose up and unanimously echoed 'never again'. We, the Biafrans only demand for an internationally recognized and monitored referendum from Nigeria. It is only the ignorant and mischievous elements among the pro-Nigeria savages that equate referendum with war.